"Boston bomber" redirects here. For the Douglas Boston bomber aircraft, see Douglas A-20 Havoc. During the annual Boston Marathon on April 15, 2013, two homemade pressure cooker bombs detonated 14 seconds and 210 yards (190 m) apart at 2:49 p.m., near the finish line of the race, killing three people and injuring several hundred others, including 16 who lost limbs. Three days later, the Federal Bureau of Investigation (FBI) released images of two suspects, who were later identified as Chechen Kyrgyzstani-American brothers Dzhokhar Tsarnaev and Tamerlan Tsarnaev. They killed an MIT policeman, kidnapped a man in his car, and had a shootout with the police in nearby Watertown, during which two officers were severely injured, one of whom died a year later. Tamerlan was shot several times, and his brother ran him over while escaping in the stolen car; Tamerlan died soon after. An unprecedented manhunt for Dzhokhar ensued on April 19, with thousands of law enforcement officers searching a 20-block area of Watertown; residents of Watertown and surrounding communities were asked to stay indoors, and the transportation system and most businesses and public places closed. Around 6:00 p.m., a Watertown resident discovered Dzhokhar hiding in a boat in his backyard. He was shot and wounded by police before being taken into custody. During questioning, Dzhokhar said that he and his brother were motivated by extremist Islamist beliefs and the wars in Iraq and Afghanistan, that they were self-radicalized and unconnected to any outside terrorist groups, and that he was following his brother's lead. He said they learned to build explosive devices from an online magazine of the al-Qaeda affiliate in Yemen. He also said they had intended to travel to New York City to bomb Times Square. On April 8, 2015, he was convicted of 30 charges, including use of a weapon of mass destruction and malicious destruction of property resulting in death. Two months later, he was sentenced to death. 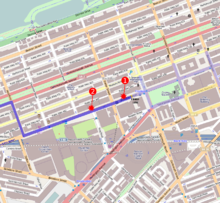 The blasts (red) occurred along the marathon course (dark blue), the first nearer the finish line than the second. The 117th annual Boston Marathon was run on Patriots' Day, April 15, 2013. At 2:49 p.m. EDT (18:49 UTC), two bombs detonated about 210 yards (190 m) apart at the finish line on Boylston Street near Copley Square. The first exploded outside Marathon Sports at 671–673 Boylston Street at 2:49:43 p.m. At the time of the first explosion, the race clock at the finish line showed 04:09:43 – the elapsed time since the Wave 3 start at 10:40 a.m. The second bomb exploded at 2:49:57 p.m., about 14 seconds later and one block farther west at 755 Boylston Street. The explosions took place nearly three hours after the winning runner crossed the finish line, but with more than 5,700 runners yet to finish. Windows on adjacent buildings were blown out but there was no structural damage. Runners continued to cross the line until 2:57 p.m. Dropped bags and packages, abandoned as their owners fled from the blasts, increased uncertainty as to the possible presence of more bombs and many false reports were received. An unrelated electrical fire at the John F. Kennedy Presidential Library in nearby Dorchester was initially feared to be a bomb. The airspace over Boston was restricted, and departures halted from Boston's Logan International Airport. Some local transit service was halted as well. The Massachusetts Emergency Management Agency suggested people trying to contact those in the vicinity use text messaging instead of voice calls because of crowded cellphone lines. Cellphone service in Boston was congested but remained in operation, despite some local media reports stating that cell service was shut down to prevent cell phones from being used as detonators. The American Red Cross helped concerned friends and family receive information about runners and casualties. The Boston Police Department also set up a helpline for people concerned about relatives or acquaintances to contact and a line for people to provide information. Google Person Finder activated their disaster service under Boston Marathon Explosions to log known information about missing people as a publicly viewable file. Due to the closure of several hotels near the blast zone, a number of visitors were left with nowhere to stay; many Boston-area residents opened their homes to them. 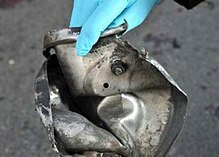 This pressure cooker fragment was part of one of the explosive devices. United States government officials stated that there had been no intelligence reports suggesting such an attack. Representative Peter King, a member of the House Intelligence Committee, said: "I received two top secret briefings last week on the current threat levels in the United States, and there was no evidence of this at all." 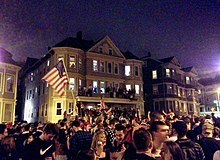 After being identified, the father of the two suspects claimed that the FBI had been watching his family, and that they visited his sons' home in Cambridge, Massachusetts five times, most recently in 2011, as "preventive work... afraid there might be some explosions on the streets of Boston." Evidence found near the blast sites included bits of metal, nails, ball bearings, black nylon pieces from a backpack, remains of an electronic circuit board, and wiring. A pressure cooker lid was found on a nearby rooftop. Both of the improvised explosive devices were pressure cooker bombs manufactured by the bombers. Authorities confirmed that the brothers used bomb-making instructions found in Al Qaeda in the Arabian Peninsula's Inspire magazine. After the suspects were identified, The Boston Globe reported that Tamerlan purchased fireworks from a fireworks store in New Hampshire. On April 19, the FBI, West New York Police Department, and Hudson County Sheriff's Department seized computer equipment from the apartment of the Tsarnaevs' sister in West New York, New Jersey. On April 24, investigators reported that they had reconstructed the bombs, and believed that they had been triggered by remote controls used for toy cars. Shooting: April 18, 2013, 10:48 p.m.
Firefight and manhunt: April 19, 2013, 12:30 a.m. – 8:42 p.m.
Jeff Bauman was immediately adjacent to one of the bombs and lost both legs; he wrote while in the hospital: "Bag, saw the guy, looked right at me". He later gave a detailed description which enabled the photo to be identified and circulated quickly. At 5:20 p.m. on April 18, the FBI released images of two suspects carrying backpacks, asking the public's help in identifying them. The FBI said that they were doing this in part to limit harm to people wrongly identified by news reports and on social-media. As seen on video, the suspects stayed to observe the chaos after the explosions, then walked away casually. The public sent authorities a deluge of photographs and videos, which were scrutinized by both authorities and online public social networks. A few hours after the photos were released, the Tsarnaev brothers shot Sean A. Collier of the Massachusetts Institute of Technology Police Department six times in an attempt to steal his gun, which they could not get out because of the holster's retention system. Collier, aged 27, was seated in his police car near the Stata Center (Building 32) on the Massachusetts Institute of Technology campus. He died soon after. The brothers then carjacked a Mercedes-Benz M-Class SUV in the Allston-Brighton neighborhood of Boston. Tamerlan took the owner, Chinese national Dun "Danny" Meng (Chinese: 孟盾), hostage and told him that he was responsible for the Boston bombing and for killing a police officer. Dzhokhar followed them in the green Honda, later joining them in the Mercedes-Benz. Interrogation later revealed that the brothers "decided spontaneously" that they wanted to go to New York and bomb Times Square. The Tsarnaev brothers forced Meng to use his ATM cards to obtain $800 in cash. They transferred objects to the Mercedes-Benz and one brother followed it in their Honda Civic, for which an all-points bulletin was issued. While the Tsarnaev brothers stopped at a Shell gas station, Meng escaped and ran across the street to the Mobil gas station, asking the clerk to call 911. His cell phone remained in the vehicle, allowing the police to focus their search on Watertown. According to Watertown Police Chief Edward Deveau, the brothers had an "arsenal of guns." Tamerlan ran out of ammunition and threw his empty pistol at Sergeant Jeffrey Pugliese, who tackled him with help from Sergeant John MacLellan. Tamerlan's younger brother Dzhokhar then drove the stolen SUV toward Tamerlan and police who unsuccessfully tried to drag Tamerlan out of his path; the car ran over Tamerlan and dragged him a short distance down the street. Dzhokhar abandoned the car half a mile away and fled on foot. Tamerlan Tsarnaev died at 1:35 a.m. at a Boston hospital. Massachusetts Bay Transportation Authority Police Officer Richard H. Donohue Jr. was also critically wounded but survived. Boston Police Department officer Dennis Simmonds was injured by a hand grenade and died April 10, 2014. Fifteen other officers were also injured. A later report by Harvard Kennedy School's Program on Crisis Leadership concluded that lack of coordination among police agencies had put the public at excessive risk during the shootout. Only one firearm was recovered at the scene, a Ruger 9 mm pistol with a defaced serial number. Records on the Honda left at the scene identified the men as two brothers whose family had immigrated to the United States seeking political asylum around 2002: 26-year-old Tamerlan Tsarnaev and 19-year-old Dzhokhar "Jahar" Tsarnaev. The FBI released additional photos of the two during the Watertown incident. Early on April 19, Watertown residents received automated calls asking them to stay indoors. That same morning Governor Patrick asked residents of Watertown and adjacent cities and towns to "shelter in place". Somerville residents also received automated calls instructing them to shelter in place. A 20-block area of Watertown was cordoned off and residents were told not to leave their homes or answer the door, as officers scoured the area in tactical gear. Helicopters circled the area and SWAT teams in armored vehicles moved through in formation, with officers going door to door. On the scene were the FBI, the Bureau of Alcohol, Tobacco, Firearms and Explosives, the Department of Homeland Security, the National Guard, the Boston and Watertown Police departments, and the Massachusetts State Police. The show of force was the first major field test of the interagency task forces created in the wake of the September 11 attacks. The brothers' father spoke from his home in Makhachkala, Dagestan, encouraging his son to: "Give up. Give up. You have a bright future ahead of you. Come home to Russia." He continued, "If they killed him, then all hell would break loose." On television, Dzhokhar's uncle from Montgomery Village, Maryland, pleaded with him to turn himself in. David Henneberry, a Watertown resident outside the search area, noticed that the tarp was loose on his parked boat on the evening of April 19, two hours after the shelter-in-place order had been lifted. He then saw a body lying inside the boat in a pool of blood. Authorities surrounded the boat and a police helicopter verified movement through a thermal imaging device. The figure inside the boat started poking at the tarp, and police shot at the boat. According to Boston Police Commissioner Ed Davis and Watertown Police Chief Deveau, Dzhokhar Tsarnaev was shooting at police from inside the boat, "exchanging fire for an hour". A subsequent report indicated that the firing lasted for a shorter time. The suspect was found to have no weapon when he was captured. He was arrested at 8:42 p.m. and taken to Beth Israel Deaconess Medical Center, where he was listed in critical condition with gunshot wounds to the head, neck, legs, and hand. Initial reports that the neck wound represented a suicide attempt were contradicted by his being unarmed. The situation was chaotic according to a police source quoted by the Washington Post, and the firing of weapons occurred during "the fog of war". A subsequent review by the Commonwealth of Massachusetts provided this more specific summary: "One officer fired his weapon without appropriate authority in response to perceived movement in the boat, and surrounding officers followed suit in a round of 'contagious fire', assuming they were being fired on by the suspect. Weapons continued to be fired for several seconds until on scene supervisors ordered a ceasefire and regained control of the scene. The unauthorized shots created another dangerous crossfire situation". United States Senators Kelly Ayotte, Saxby Chambliss, Lindsey Graham, and John McCain, and Representative Peter T. King suggested that Dzhokhar Tsarnaev, a U.S. citizen, should be tried as an unlawful enemy combatant rather than as a criminal, potentially preventing him from obtaining legal counsel. Others said that doing so would be illegal, including prominent American legal scholar and lawyer Alan Dershowitz, and would jeopardize the prosecution. The government decided to try Dzhokhar in the federal criminal court system and not as an enemy combatant. Dzhokhar was questioned for 16 hours by investigators but stopped communicating with them on the night of April 22 after Judge Marianne Bowler read him a Miranda warning. Dzhokhar had not previously been given a Miranda warning, as federal law enforcement officials invoked the warning's public safety exception. This raised doubts whether his statements during this investigation would be admissible as evidence and led to a debate surrounding Miranda rights. On April 22, 2013, formal criminal charges were brought against Tsarnaev in the United States District Court for the District of Massachusetts during a bedside hearing while he was hospitalized. He was charged with use of a weapon of mass destruction and with malicious destruction of property resulting in death. Some of the charges carry potential sentences of life imprisonment or the death penalty. Tsarnaev was judged to be awake, mentally competent, and lucid, and he responded to most questions by nodding. The judge asked him whether he was able to afford an attorney and he said no; he was represented by the Federal Public Defender's office. On April 26, Dzhohkar Tsarnaev was moved from Beth Israel Deaconess Medical Center to the Federal Medical Center at Fort Devens, about 40 miles (64 km) from Boston. FMC Devens is a federal prison medical facility at a former Army base where he was held in solitary confinement at a segregated housing unit with 23-hour-per-day lockdown. On July 10, 2013, Tsarnaev pleaded not guilty to 30 charges in his first public court appearance, including a murder charge for MIT police officer Sean Collier. He was back in court for a status hearing on September 23, and his lawyers requested more time to prepare their defense. On October 2, Tsarnaev's attorneys asked the court to lift the special administrative measures (SAMs) imposed by Attorney General Holder in August, saying that the measures had left Tsarnaev unduly isolated from communication with his family and lawyers, and that no evidence suggested that he posed a future threat. Jury selection began on January 5, 2015 and was completed on March 3, with a jury consisting of eight men and ten women (including six alternates). The trial began on March 4 with Assistant U.S. Attorney William Weinreb describing the bombing and painting Dzhokhar as "a soldier in a holy war against Americans" whose motive was "reaching paradise". He called the brothers equal participants. Defense attorney Judy Clarke admitted that Dzhokhar Tsarnaev had placed the second bomb and was present at the murder of Sean Collier, the carjacking of Dun Meng, and the Watertown shootout, but she emphasized the influence that his older brother had on him, portraying him as a follower. Between March 4 and 30, prosecutors called more than 90 witnesses, including bombing survivors who described losing limbs in the attack, and the government rested its case on March 30. The defense rested as well on March 31, after calling four witnesses. Tsarnaev was found guilty on all 30 counts on April 8. The sentencing phase of the trial began April 21, and a further verdict was reached on May 15 recommending that he be put to death. Tsarnaev was sentenced to death on June 24, after apologizing to the victims.In 2018 Tsarnaev's lawyers appealed on the grounds that a lower-court judge's refusal to move the case to another city not traumatized by the bombings deprived him of a fair trial. According to FBI interrogators, Dzhokhar and his brother were motivated by Islamic beliefs but "were not connected to any known terrorist groups", instead learning to build explosive weapons from an online magazine published by al-Qaeda affiliates in Yemen. They further alleged that "[Dzhokhar and] his brother considered suicide attacks and striking [the Boston Pops Fireworks Spectacular] on the Fourth of July; but ultimately decided to use pressure cooker bombs (capable of remote detonation) and other IEDs." Fox News reported that the brothers "chose the prestigious race as a 'target of opportunity' ... [after] the building of the bombs came together more quickly than expected". Dzhokhar said that he and his brother wanted to defend Islam from the U.S., accusing the U.S. of conducting the Iraq War and War in Afghanistan against Muslims. A CBS report revealed that Dzhokhar had scrawled a note with a marker on the interior wall of the boat where he was hiding; the note stated that the bombings were "retribution for U.S. military action in Afghanistan and Iraq", and called the Boston victims "collateral damage", "in the same way innocent victims have been collateral damage in U.S. wars around the world." Photographs of the note were later used in the trial. Some political science and public policy writers suggest that Islam may have played a secondary role in the attacks. These writers theorize that the primary motives might have been sympathy towards the political aspirations in the Caucasus region and Tamerlan's inability to become fully integrated into American society. According to the Los Angeles Times, a law enforcement official said that Dzhokhar "did not seem as bothered about America's role in the Muslim world" as his brother Tamerlan had been. Dzhokhar identified Tamerlan as the "driving force" behind the bombing, and said that his brother had only recently recruited him to help. Some journalists and Dzhokhar Tsarnaev's defense attorney have suggested that the FBI may have recruited or attempted to recruit Tamerlan Tsarnaev as an informant. Tamerlan Tsarnaev was born in 1986 in the Kalmyk Autonomous Soviet Socialist Republic, North Caucasus. Dzhokhar was born in 1993 in Kyrgyzstan, although some reports say that his family claims that he was born in Dagestan. The family spent time in Tokmok, Kyrgyzstan, and in Makhachkala, Dagestan. They are half Chechen through their father Anzor, and half Avar through their mother Zubeidat. They never lived in Chechnya, yet the brothers identified themselves as Chechen. The Tsarnaev family immigrated to the United States in 2002 where they applied for political asylum, settling in Cambridge, Massachusetts. Tamerlan Tsarnaev attended Bunker Hill Community College but dropped out to become a boxer. His goal was to gain a place on the U.S. Olympic boxing team, saying that, "unless his native Chechnya becomes independent", he would "rather compete for the United States than for Russia". He married U.S. citizen Katherine Russell on July 15, 2010 in the Masjid Al Quran Mosque in the Dorchester section of Boston; she was pregnant with their daughter. While initially quoted in a student magazine as saying, "I don't have a single American friend. I don't understand them," a later FBI interview report documents Tamerlan stating it was a misquote, and that most of his friends were American. He had a history of violence, including an arrest in July 2009 for assaulting his girlfriend. The brothers were Muslim; Tamerlan's aunt stated that he had recently become a devout Muslim. Tamerlan became more devout and religious after 2009, and a YouTube channel in his name linked to Salafist and Islamist videos. The FBI was informed by the Russian Federal Security Service (FSB) in 2011 that he was a "follower of radical Islam." In response, the FBI interviewed Tamerlan and his family and searched databases, but they did not find any evidence of "terrorism activity, domestic or foreign." During the 2012 trip to Dagestan, Tamerlan was reportedly a frequent visitor at a mosque on Kotrova Street in Makhachkala, believed by the FSB to be linked with radical Islam. Some believe that "they were motivated by their faith, apparently an anti-American, radical version of Islam" acquired in the U.S., while others believe that the turn happened in Dagestan. At the time of the bombing, Dzhokhar Tsarnaev was a student at the University of Massachusetts Dartmouth with a major in marine biology. He became a naturalized U.S. citizen on September 11, 2012. Tamerlan's boxing coach reported to NBC that the young brother was greatly affected by Tamerlan and admired him. Tamerlan was previously connected to the triple homicide in Waltham, Massachusetts, on the evening of September 11, 2011, but he was not a suspect at the time. Brendan Mess, Erik Weissman, and Raphael Teken were murdered in Mess's apartment. All had their throats slit from ear to ear with such great force that they were nearly decapitated. The local district attorney said that it appeared that the killer and the victims knew each other, and that the murders were not random. Tamerlan Tsarnaev had previously described murder victim Brendan Mess as his "best friend." After the bombing and subsequent revelations of Tsarnaev's personal life, the Waltham murders case was reexamined in April 2013 with Tsarnaev as a new suspect. Both ABC and The New York Times have reported that there is strong evidence which implicates Tsarnaev in this triple homicide. Some analysts claim that the Tsarnaev's mother Zubeidat Tsarnaeva is a radical extremist and supporter of jihad who influenced her sons' behavior. This prompted the Russian government to warn the U.S. government on two occasions about the family's behavior. Both Tamerlan and his mother were placed on a terrorism watch list about 18 months before the bombing took place. On April 15, several people who were near the scene of the blast were taken into custody and questioned about the bombing, including a Saudi man whom police stopped as he was walking away from the explosion; they detained him when some of his responses made them uncomfortable. Law enforcement searched his residence in a Boston suburb, and the man was found to have no connection to the attack. An unnamed U.S. official said, "he was just at the wrong place at the wrong time." On the night of April 18, two men riding in a taxi in the vicinity of the shootout were arrested and released shortly thereafter when police determined that they were not involved in the Marathon attacks. Another man was arrested several blocks from the site of the shootout and was forced to strip naked by police who feared that he might have concealed explosives. He was released that evening after a brief investigation determined that he was an innocent bystander. On May 22, the FBI interrogated Ibragim Todashev in Orlando, Florida, who was a Chechen from Boston. During the interrogation, he was shot and killed by an FBI agent who claimed that Todashev attacked him. The New York Times quoted an unnamed law enforcement official as saying that Todashev had confessed to a triple homicide and had implicated Tsarnaev, as well. Todashev's father claimed his son is innocent and that federal investigators are biased against Chechens and made up their case against him. Robel Phillipos (19) was a U.S. citizen of Ethiopian descent living in Cambridge who was arrested and faced with charges of knowingly making false statements to police. He graduated from high school in 2011 with Dzhokhar Tsarnaev. Dias Kadyrbayev (19) and Azamat Tazhayakov (20) were natives of Kazakhstan living in the U.S. They were Dzhokhar Tsarnaev's roommates in an off-campus housing complex in New Bedford, Massachusetts at which Tsarnaev had sometimes stayed. Phillipos, Kadyrbayev, Tazhayakov, and Tsarnaev entered the University of Massachusetts Dartmouth in the fall of 2011 and knew each other well. After seeing photos of Tsarnaev on television, the three men traveled to his dorm room where they retrieved a backpack and laptop belonging to Tsarnaev. The backpack was discarded, but police recovered it and its contents in a nearby New Bedford landfill on April 26. During interviews, the men initially denied visiting the dorm room but later admitted their actions. Kadyrbayev and Tazhayakov were arrested by police at the off-campus housing complex during the night of April 18–19. An unidentified girlfriend of one of the men was also arrested, but all three were soon released. 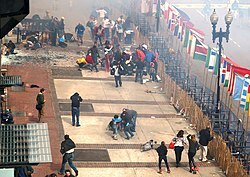 willfully conspir(ing) with each other to commit an offense against the United States… by knowingly destroying, concealing, and covering up objects belonging to Dzhokhar Tsarnaev, namely, a backpack containing fireworks and a laptop computer, with the intent to impede, obstruct, and influence the criminal investigation of the Marathon bombing. Kadyrbayev and Tazhayakov were indicted by a federal grand jury on August 8, 2013 on charges of conspiracy to obstruct justice for helping Dzhokhar Tsarnaev dispose of a laptop computer, fireworks, and a backpack after the bombing. Each faced up to 25 years in prison and deportation if convicted. Tazhayakov was convicted of obstruction of justice and conspiracy on July 21, 2014. Kadyrbayev pleaded guilty to obstruction charges on August 22, 2014, but sentencing was delayed pending the U.S. Supreme Court's ruling in Yates v. United States. Kadyrbayev was sentenced to six years in prison in June 2015. Tazhayakov pleaded not guilty and went to trial, arguing that "Kadyrbayev was the mastermind behind destroying the evidence and that Tazhayakov only 'attempted obstruction.'" Jurors returned a guilty verdict against him, however, and he was sentenced to 42 months in prison in June 2015, which equated to three and a half years. Judge Douglas Woodlock gave a lighter sentence to Tazahayakov than to Kadyrbayev, who was viewed as more culpable. Tazhayakov was released in May 2016 and subsequently deported. Phillipos was arrested and faced charges of knowingly making false statements to police. He was released on $100,000 bail and placed under house confinement with an ankle monitor. He was convicted on October 28, 2014, on two charges of lying about being in Tsarnaev's dorm room. He later acknowledged that he had been in the room while two friends removed a backpack containing potential evidence relating to the bombing. Phillipos faced a maximum sentence of eight years' imprisonment on each count. In June 2015, U.S. District Judge Douglas P. Woodlock sentenced him to three years in prison. Phillipos filed an appeal, but his sentence was upheld in court on February 28, 2017. Phillipos was released from prison in Philadelphia on February 26, 2018 and must serve a three year probation upon his release. A federal indictment was unsealed against Khairullozhon Matanov on May 30, 2014, charging him with "one count of destroying, altering, and falsifying records, documents, and tangible objects in a federal investigation, specifically information on his computer, and three counts of making materially false, fictitious, and fraudulent statements in a federal terrorism investigation." Matanov bought dinner for the two Tsarnaev brothers 40 minutes after the bombing. 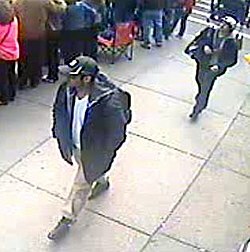 After the Tsarnaev brothers' photos were released to the public, Matanov viewed the photos on the CNN and FBI websites before attempting to reach Dzhokhar, and then tried to give away his cell phone and delete hundreds of documents from his computer. Prosecutors said that Matanov attempted to mislead investigators about the nature of his relationship with the brothers and to conceal that he shared their philosophy of violence. Matanov was originally from Kyrgyzstan. He came to the U.S. in 2010 on a student visa, and later claimed asylum. He attended Quincy College for two years before dropping out to become a taxicab driver. He was living in Quincy, Massachusetts at the time of his arrest, and was a friend of Tamerlan Tsarnaev. In March 2015, Matanov pleaded guilty to all four counts. In June 2015, he was sentenced to 30 months in prison. Three people were killed in the bombing. Krystle Marie Campbell, a 29-year-old restaurant manager from Medford, Massachusetts, was killed by the first bomb. Lü Lingzi, (Chinese: 吕令子) a 23-year-old Chinese national and Boston University statistics graduate student from Shenyang, Liaoning, and 8-year old Martin William Richard from the Dorchester neighborhood of Boston, were killed by the second bomb. Sean A. Collier, 27 years old, was ambushed by the bombers as he sat in his police car on April 18, at about 10:48 p.m. He was an MIT police officer, and had been with the Somerville Auxiliary Police Department from 2006 to 2009. He died from multiple gunshot wounds. Boston Police Department officer Dennis Simmonds died on April 10, 2014 from hand-grenade injuries received during the Watertown shootout a year earlier. According to the Boston Public Health Commission, 264 civilians were treated at 27 local hospitals. Eleven days later, 29 remained hospitalized, one in critical condition. Many victims had lower leg injuries and shrapnel wounds, which indicated that the devices were low to the ground. At least 16 civilians lost limbs, at the scene or by surgical amputation, and three lost more than one limb. Doctors described removing "ball-bearing type" metallic beads a little larger than BBs and small carpenter-type nails about 0.5 to 1 inch (1 to 3 cm) long. Similar objects were found at the scene. The New York Times cited doctors as saying that the bombs mainly injured legs, ankles, and feet because they were low to the ground, instead of fatally injuring abdomens, chests, shoulders, and heads. Some victims had perforated eardrums. MBTA police officer Richard H. Donohue Jr. (33) was critically wounded during a firefight with the bombers just after midnight on April 19. He lost almost all of his blood, and his heart stopped for 45 minutes, during which time he was kept alive by cardiopulmonary resuscitation. The Boston Globe reported that Donohue may have been accidentally shot by a fellow officer. Marc Fucarile lost his right leg and received severe burns and shrapnel wounds. He was the last victim released from hospital care on July 24, 2013. Law enforcement, local and national politicians, and various heads of state reacted quickly to the bombing, generally condemning the act and expressing sympathies for the victims. The One Fund Boston was established by Massachusetts Governor Deval Patrick and Boston mayor Thomas Menino to make monetary distributions to bombing victims. The Boston Strong concert at the TD Garden in Boston on May 30, 2013 benefitted the One Fund, which ultimately received more than $69.8 million in donations. A week after the bombing, crowd funding websites received more than 23,000 pledges promising more than $2 million for the victims, their families, and others affected by the bombing. The Israel Trauma Coalition for Response and Preparedness sent six psychologists and specialists from Israel to help Boston emergency responders, government administrators, and community people develop post-terrorist attack recovery strategies. Victims of the bombing are remembered at Copley Square in Boston. Numerous sporting events, concerts, and other public entertainment were postponed or cancelled in the days following the bombing. The MBTA public transit system was under heavy National Guard and police presence and it was shut down a second time April 19 during the manhunt. In the days after the bombing, makeshift memorials began to spring up along the cordoned-off area surrounding Boylston Street. The largest was located on Arlington Street, the easternmost edge of the barricades, starting with flowers, tokens, and T-shirts. In June, the Makeshift Memorial located in Copley Square was taken down and the memorial objects located there were moved to the archives in West Roxbury for cleaning, fumigation, and archiving. Five years after the bombing, The Boston Globe reported all of the items from the memorials were being housed in a climate controlled environment, free of charge, by the storage company, Iron Mountain in Northborough, Massachusetts. Some of the items are also being stored in Boston's city archives in West Roxbury. Boston University established a scholarship in honor of Lü Lingzi, a student who died in the bombing. University of Massachusetts Boston did the same in honor of alumna and bombing victim Krystle Campell. MIT also established a scholarship and erected a sculpture (unveiled on April 29, 2015), both in memory of MIT Police officer Sean Collier. One study conducted by the Institute for Public Service at Suffolk University in Boston, Massachusetts, records the mental health and emotional response of various survivors, for three years following the bombing. In doing so, it reviews the kinds of aid that were available in local hospitals and gives advice as to how a person or community may be healed. This study also mentions that after realizing the under coverage of people in the city being killed or injured on a daily basis, the city of Boston "applied for and received a grant from The Rockefeller Foundation to be part of their 100 resilient cities network and to develop a cross cutting resilience strategy". However, there was rising anti-Muslim sentiment online and locally in the weeks following the bombing, causing distress in the local Muslim community and leaving some afraid of going out. President Barack Obama addressed the nation after the attack. He said that the perpetrators were still unknown, but that the government would "get to the bottom of this" and that those responsible "will feel the full weight of justice". He ordered flags to half-staff until April 20 on all federal buildings as "a mark of respect for the victims of the senseless acts of violence perpetrated on April 15, 2013 in Boston, Massachusetts." Moments of silence were held at various events across the country, including at the openings of the New York Stock Exchange, NASDAQ, and NYMEX on the day after the bombing. Numerous special events were held, including marathons and other runs. The bombing was denounced and condolences were offered by many international leaders as well as leading figures from international sport. Security measures were increased worldwide in the wake of the attack. In China, users posted condolence messages on Weibo in response to the death of Lü Lingzi. Chris Buckley of The New York Times said "Ms. Lu's death gave a melancholy face to the attraction that America and its colleges exert over many young Chinese." Laurie Burkitt of The Wall Street Journal said "Ms. Lu's death resonates with many in China" due to the one-child policy. Organizers of the London Marathon, which was held six days after the Boston bombing, reviewed security arrangements for their event. Hundreds of extra police officers were drafted in to provide a greater presence on the streets, and a record 700,000 spectators lined the streets. Runners in London observed a 30-second silence in respect for the victims of Boston shortly before the race began, and many runners wore black ribbons on their vests. Organizers also pledged to donate US$3 to a fund for Boston Marathon victims for every person who finished the race. Organizers of the 2013 Vancouver Sun Run, which was held on April 21, 2013, donated $10 from every late entry for the race to help victims of the bombing at the Boston Marathon. Jamie Pitblado, vice-president of promotions for The Vancouver Sun and The Province, said the money would go to One Fund Boston, an official charity that collected donations for the victims and their families. Sun Run organizers raised anywhere from $25,000 to $40,000. There were over 48,000 participants, many dressed in blue and yellow (Boston colors) with others wearing Boston Red Sox caps. Petr Gandalovic, ambassador of the Czech Republic, released a statement after noticing much confusion on Facebook and Twitter between his nation and the Chechen Republic. "The Czech Republic and Chechnya are two very different entities – the Czech Republic is a Central European country; Chechnya is a part of the Russian Federation." Security was also stepped up in Singapore in response to online threats made on attacking several locations in the city-state and the Singapore Marathon in December. Two suspects were investigated and one was eventually arrested for making false bomb threats. The Russian government said special attention would be paid to security at upcoming international sports events in Russia, including the 2014 Winter Olympics. According to the Russian embassy in the U.S., President Vladimir Putin condemned the bombing as a "barbaric crime" and "stressed that the Russian Federation will be ready, if necessary, to assist in the U.S. authorities' investigation." He urged closer cooperation of security services with Western partners but other Russian authorities and mass media blamed the U.S. authorities for negligence as they warned the U.S. of the Tsarnaevs. Moreover Russian authorities and mass media since the spring of 2014 blame the United States for politically motivated false information about the lack of response from Russian authorities after subsequent U.S. requests. As proof a letter from the Russian Federal Security Service (FSB) was shown to the members of an official U.S. Congressional delegation to Moscow during their visit. This letter with information about Tsarnaev (including his biography details, connections and phone number) had been sent from the FSB to the FBI and CIA during March 2011. Republican U.S. Senators Saxby Chambliss and Richard Burr reported that Russian authorities had separately asked both the FBI (at least twice: during March and November 2011) and the CIA (September 2011) to look carefully into Tamerlan Tsarnaev and provide more information about him back to Russia. Russian Federal Security Service (FSB) secretly recorded phone conversations between Tamerlan Tsarnaev and his mother (they vaguely and indirectly discussed jihad) and sent these to the FBI as evidence of possible extremist links within the family. However, while Russia offered US intelligence services warnings that Tsarnaev planned to link up with extremist groups abroad, an FBI investigation yielded no evidence to support those claims at the time. In addition, subsequent U.S. requests for additional information about Tsarnaev went unanswered by the Russians. Any attempt to make a link between Chechnya and the Tsarnaevs, if they are guilty, is in vain. They grew up in the U.S., their views and beliefs were formed there. The roots of evil must be searched for in America. The whole world must battle with terrorism. We know this better than anyone. We wish recover [sic] to all the victims and share Americans' feeling of sorrow. Akhmed Zakayev, head of the secular wing of the Chechen separatist movement, now in exile in London, condemned the bombing as "terrorist" and expressed condolences to the families of the victims. Zakayev denied that the bombers were in any way representative of the Chechen people, saying that "the Chechen people never had and can not have any hostile feelings toward the United States and its citizens." The Mujahideen of the Caucasus Emirate Province of Dagestan, the Caucasian Islamist organization in both Chechnya and Dagestan, denied any link to the bombing or the Tsarnaev brothers and stated that it was at war with Russia, not the United States. It also said that it had sworn off violence against civilians since 2012. During the manhunt for the perpetrators of the bombing, Governor Deval Patrick said "we are asking people to shelter in place." The request was highly effective; most people stayed home, causing Boston, Watertown, and Cambridge to come to a virtual standstill. According to Time magazine, "media described residents complying with a 'lockdown order,' but in reality the governor's security measure was a request." Scott Silliman, emeritus director of the Center on Law, Ethics and National Security at Duke Law School, said that the shelter-in-place request was voluntary. The shelter-in-place directive was criticized by some commentators. Michael Cohen of The Observer said that Americans have little experience with daily terrorism compared to some countries and "are more primed to … assume the absolute worst." Cohen wrote that it was not the first time dangerous murderers have been on the loose in a large American city (citing Christopher Dorner in 2013 and the Beltway sniper attacks in 2002), but noted that "lockdown" measures were not used in those cases. Former congressman and presidential candidate Ron Paul, criticized what he described as a "military-style takeover of parts of Boston" during the investigation and wrote that "this unprecedented move should frighten us as much or more than the attack itself." Haaretz's Chemi Salev wrote that "in terms of cost-benefit analysis, from the evil terrorist's point of view, the Boylston Street bombings and their aftermath can only be viewed as a resounding triumph" since the "relatively amateurish" terrorists managed to intimidate a vast number of people and got a maximum amount of publicity. Responding to Salev in The New York Times, Ross Douthat commented that the massive manhunt operation might deter other amateur terrorists, but not hard-core terrorists such as Mohammed Atta. Douthat argued that out-of-the-ordinary measures can only be used when terrorism itself is out-of-the-ordinary: if attacks started to occur more often, people would not be as willing to comply with shelter-in-place commands, yet once a terrorist has been hunted with such an operation, it is hard to justify why such measures should not be taken the next time. The National Lawyers Guild and some news outlets questioned the constitutionality of the door-to-door searches conducted by law enforcement officers looking for Dzhokhar Tsarnaev. On the second anniversary of the Boston Marathon Bombings, Mayor Marty Walsh established April 15th, the day of the bombings, as an official and permanent holiday called "One Boston Day", dedicated to conducting random acts of kindness and helping others out. Over the past four years, some examples of acts of kindness being done have been donating blood to the American Red Cross, donating food to the Greater Boston Food Bank, opening free admission in places like the Museum of Science and Museum of Fine Arts, donating shoes to homeless shelters, and donating to military and veteran charities. Boston Police Commissioner Edward F. Davis gives a news conference about the bombing on April 15. Governor Deval Patrick is second from right and Suffolk District Attorney Daniel F. Conley is at far left. On the afternoon of the bombing, the New York Post reported that a suspect, a Saudi Arabian male, was under guard and being questioned at a Boston hospital. That evening, Boston Police Commissioner Ed Davis said that there had not been an arrest. The Post did not retract its story about the suspect, leading to widespread reports by CBS News, CNN, and other media that a Middle Eastern suspect was in custody. The day after the bombing, a majority of outlets were reporting that the Saudi was a witness, not a suspect. The New York Post on its April 18 front page showed two men, and said they were being sought by the authorities. The two were not the ones being sought as suspects. They were a 17-year-old boy and his track coach. The boy, from Revere, Massachusetts, turned himself over to the police immediately and was cleared after a 20-minute interview in which they advised him to deactivate his Facebook account. New York Post editor Col Allan stated, "We stand by our story. The image was emailed to law enforcement agencies yesterday afternoon seeking information about these men, as our story reported. We did not identify them as suspects." The two were implied to be possible suspects via crowdsourcing on the websites Reddit and 4chan. Several other people were mistakenly identified as suspects. Two of those wrongly identified as suspects on Reddit were a 17-year-old track star and Sunil Tripathi, a Brown University student missing since March. Tripathi was found dead on April 23 in the Providence River. The decision to release the photos of the Tsarnaev brothers was made in part to limit damage done to those misidentified on the Internet and by the media, and to address concerns over maintaining control of the manhunt. A film about the Boston Marathon bombing and subsequent manhunt, Patriots Day, was released in December 2016. Another film, Stronger, which chronicles survivor Jeff Bauman, was released in September 2017. ^ Taxi service was restored before the manhunt ended and transit service resumed. ^ a b Straw, Joseph; Ford, Bev; McShane, Lawrence (April 17, 2013). "Police narrow in on two suspects in Boston Marathon bombings". The Daily News. New York. Retrieved May 15, 2013. ^ a b c d "United States vs. Dzhokhar Tsarnaev, Case 1:13-mj-02106-MBB" (PDF). United States Department of Justice. April 21, 2013. Archived from the original (PDF) on March 13, 2014. Retrieved April 22, 2013. ^ Cooper, Michael; Schmidt, Michael S.; Schmitt, Eric (April 23, 2013). "Boston Suspects Are Seen as Self-Taught and Fueled by Web". The New York Times. Retrieved April 11, 2015. ^ a b "Boston bombings suspect Dzhokhar Tsarnaev left note in boat he hid in, sources say". CBS. May 16, 2013. Retrieved April 11, 2015. ^ a b "Boston Suspect's Writing on the Wall". consortiumnews.com. Retrieved April 8, 2015. ^ a b c Kotz, Deborah (April 24, 2013). "Injury toll from Marathon bombs reduced to 264". The Boston Globe. Retrieved April 29, 2013. Boston public health officials said Tuesday that they have revised downward their estimate of the number of people injured in the Marathon attacks, to 264. ^ a b "What we know about the Boston bombing and its aftermath". CNN. April 19, 2013. Retrieved April 19, 2013. ^ a b Estes, Adam Clark; Abad-Santos, Alexander; Sullivan, Matt (April 15, 2013). "Explosions at Boston Marathon Kill 3 — Now, a 'Potential Terrorist Investigation'". The Atlantic Wire. Retrieved April 17, 2013. ^ Fromer, Frederic J. (April 15, 2013). "Justice Department Directing Full Resources To Investigate Boston Marathon Bombings". Huffington Post. Retrieved April 22, 2013. ^ des Lauriers, Richard (April 18, 2013). "Remarks of Special Agent in Charge at Press Conference on Bombing Investigation" (press release). Boston: FBI. Retrieved April 21, 2013. ^ "Boston Lockdown 'Extraordinary' But Prudent, Experts Say". April 22, 2013. Retrieved April 23, 2013. ^ "An empty metropolis: Bostonians share photos of deserted streets". April 19, 2013. Retrieved April 29, 2013. ^ "Two unnamed officials say Dzhokhar Tsarnaev, 19, did not have a gun when he was captured Friday in a Watertown, Mass. backyard. Boston Police Commissioner Ed Davis said earlier that shots were fired from inside the boat." The Associated Press Wednesday, April 24, 2013, 8:42 PM. ^ a b c d e f g h Seelye, Katharine Q.; Cooper, Michael; Rashbaum, William K. (April 19, 2013). "Boston bomb suspect is captured after standoff". The New York Times. Retrieved April 11, 2015. ^ a b Seelye, Katherine Q. (April 23, 2013). "Bombing Suspect Cites Islamic Extremist Beliefs as Motive". The New York Times. et al. Retrieved April 23, 2013. ^ Markon, Jerry; Horwitz, Sari; Johnson, Jenna (April 22, 2013). "Dzhokhar Tsarnaev charged with using 'weapon of mass destruction'". The Washington Post. Retrieved April 23, 2013. ^ "Dzhokhar Tsarnaev: Boston Marathon bomber found guilty". BBC News. April 8, 2015. Retrieved April 8, 2015. ^ "What Happened To Dzhokhar Tsarnaev? Update On Boston Marathon Bomber Sentenced To Death". International Business Times. April 16, 2017. Retrieved March 12, 2018. ^ a b c Abel, David; Silva, Steve; Finucane, Martin (April 15, 2013). "Explosions rock Boston Marathon finish line; dozens injured". The Boston Globe (online ed.). Retrieved April 15, 2013. ^ a b "Investigators recover circuit board believed used to detonate Boston Marathon blasts". The Boston Globe (online ed.). April 16, 2013. Archived from the original on April 18, 2013. Retrieved April 17, 2013. ^ Winter, Michael (April 16, 2013). "At least 3 dead, 141 injured in Boston Marathon blasts". USA Today. Retrieved April 26, 2013. ^ a b c d Levs, Joshua; Plott, Monte (April 16, 2013). "Terrorism strikes Boston Marathon as bombs kill 3, wound scores". CNN. Retrieved April 16, 2013. ^ Preston, Jennifer; Stack, Liam (April 22, 2013). "Updates in the Aftermath of the Boston Marathon Bombing: Their Stories: The People at the Finish Line". The New York Times. Retrieved April 24, 2013. ^ a b c d e McClam, Erin (April 15, 2013). "Explosions rock finish of Boston Marathon; 2 killed and at least 23 hurt, police say". NBC News. Retrieved April 15, 2013. ^ Malone, Scott; Pressman, Aaron (April 21, 2008). "Triumph turns to terror as blasts hit Boston Marathon". The Guardian. London. Retrieved April 17, 2013. ^ a b c Eligon, John; Cooper, Michael (April 15, 2013). "Boston Marathon Blasts Kill 3 and Maim Dozens". The New York Times. Retrieved April 15, 2013. ^ Benjamin, Amalie (April 15, 2013). "Events force BAA to alter course at Marathon". The Boston Globe. Retrieved April 17, 2013. ^ Florio, Michael (April 15, 2013). "Joe Andruzzi handles Boston Marathon attack the way Joe Andruzzi would". Sports. NBC. Retrieved April 15, 2013. ^ Greene, William (April 16, 2013). "Former Patriots offensive lineman Joe Andruzzi carried an injured woman away from the scene". The Boston Globe. Retrieved April 16, 2013. ^ McLaughlin, Tim (April 16, 2013). "A shaken Boston mostly gets back to work; 12-block crime scene". Reuters. Retrieved April 19, 2013. ^ "Police will have controlled explosion on 600 block on Boylston Street, a block beyond the finish line". Boston. Twitter. April 15, 2013. Retrieved April 15, 2013. ^ "Mass. gov: No unexploded bombs at Boston Marathon". The Boston Globe. Archived from the original on April 18, 2013. Retrieved April 16, 2013. ^ a b "Two and only two devices were found". Fox. April 16, 2013. ^ Levitz, Jennifer; Helliker, Kevin; Germano, Sara (April 16, 2013). "Two Explosions at Boston Marathon Finish Line". The Wall Street Journal (online ed.). Retrieved April 16, 2013. ^ Hines, Ken (April 15, 2013). "US Official: 2 Additional Explosive Devices Found Near Boston Marathon". 6 on your side. ABC. Retrieved April 16, 2013. ^ Williams, Peter (April 15, 2013). "How many explosive devices, and where?". NBC News. Washington, DC. Retrieved April 16, 2013. ^ "3/2050 NOTAM Details". Federal Aviation Administration. April 15, 2013. Archived from the original on April 18, 2013. Retrieved April 15, 2013. ^ Sullivan, Eileen (April 15, 2013). "Cellphone use heavy, but still operating in Boston". Associated Press. Archived from the original on November 30, 2013. Retrieved April 24, 2013. ^ "Live Updates: Explosions at Boston Marathon". The Washington Times (live stream from scene). April 15, 2013. Retrieved April 15, 2013. ^ "American Red Cross Statement on Boston Marathon Explosions". American Red Cross. April 15, 2013. Retrieved April 16, 2013. ^ "Boston Marathon Explosions: Third Blast". Sky News. April 15, 2013. Retrieved April 15, 2013. ^ "Boston Marathon Explosions". Person Finder. Google. April 15, 2013. Retrieved April 15, 2013. ^ "Explosions near finish of Boston marathon". CNN. April 16, 2013. ^ Hosenball, Mark; Herbst-Bayliss, Svea (April 16, 2013). "Investigators scour video, photos for Boston Marathon bomb clues". GlobalPost. Thomson Reuters. Retrieved April 16, 2013. ^ Seelye, Katharine Q.; Cooper, Michael; Schmidt, Michael S. (April 18, 2013). "FBI Posts Images of Pair Suspected in Boston Attack". The New York Times. Retrieved April 19, 2013. ^ Bengali, Shashank; Muskal, Michael (April 16, 2013). "Live updates: Obama calls Boston bombings a 'heinous, cowardly' act of terror". Los Angeles Times. Retrieved April 16, 2013. ^ "Boston bomber arrested: Tamerlan Tsarnaev was questioned by FBI in 2011". The Telegraph. London. April 20, 2013. Retrieved April 22, 2013. ^ a b c McLaughlin, Tim; Herbst-Bayliss, Svea (April 17, 2013). "Boston bomb suspect spotted on video, no arrest made". Reuters. Retrieved April 17, 2013. ^ a b "FBI seeks images in Boston Marathon bomb probe; new details emerge on explosives". News. CBS. Retrieved April 17, 2013. ^ Lister, Tim; Cruickshank, Paul (April 17, 2013). "Boston Marathon bombs similar to 'lone wolf' devices, experts say". CNN. Retrieved April 17, 2013. ^ Ellement, John; Ballou, Brian (April 17, 2013). "Boston Medical Center reports five-year-old boy in critical condition, 23 victims treated from Boston Marathon bombings". The Boston Globe. Retrieved April 17, 2013. ^ "Feds Race to Trace Boston Marathon Pressure Cooker Bomb". ABC. April 17, 2013. Retrieved April 20, 2013. ^ Isikoff, Michael (April 23, 2013). "Search of Tsarnaevs' phones, computers finds no indication of accomplice, source says". NBC News. Retrieved April 24, 2013. ^ Vinograd, Cassandra; Dodds, Paisley (April 16, 2013). "AP Glance: Pressure Cooker Bombs". Associated Press. Archived from the original on June 13, 2013. Retrieved April 16, 2013. ^ "Inspire Magazine: A Staple Of Domestic Terror". Anti-Defamation League. Retrieved April 11, 2015. ^ a b Serrano, Richard A.; Mason, Melanie; Dilanian, Ken (April 23, 2013). "Boston bombing suspect describes plot". Los Angeles Times. Retrieved April 24, 2013. ^ Dezenski, Lauren (April 23, 2013). "Older Marathon bombing suspect purchased fireworks at N.H. store, official says". The Boston Globe. Retrieved May 2, 2013. ^ Heinis, John (April 19, 2013). "Sister of Boston Bombers Draw FBI to Buchanan Place in West New York" Archived April 20, 2017, at the Wayback Machine. Hudson County TV. ^ Bennett, Brian (April 24, 2013). "Boston bombs triggered by remote controls from toy cars, FBI says". Los Angeles Times. Retrieved April 24, 2013. ^ Valencia, Milton J. (April 21, 2013). "Boston Police Commissioner Edward Davis says releasing photos was 'turning point' in Boston Marathon bomb probe". The Boston Globe. Boston. Retrieved April 10, 2015. ^ "He loved us, and we loved him". MIT. Retrieved April 11, 2015. ^ Sherman, Pat (April 21, 2013). "UCSD professor says Boston Marathon was 'lone wolf' terrorism". La Jolla Light. Archived from the original on March 7, 2014. Retrieved June 17, 2014. ^ a b Ransom, Jan (May 28, 2015). "Death benefit given to family of officer wounded in Tsarnaev shootout". The Boston Globe. Retrieved May 28, 2015. ^ a b Loder, Asjylyn; Deprez, Esmé E. (April 19, 2013). "Boston Bomb Victim in Photo Helped Identify Suspects". Bloomberg. Retrieved April 21, 2013. ^ "Bomb victim whose legs were blown off reportedly helped FBI id suspect". Fox. April 19, 2013. ^ Seelye, Katharine Q.; Cooper, Michael; Schmidt, Michael S. (April 18, 2013). "FBI Releases Images of Two Suspects in Boston Attack". The New York Times. Retrieved April 18, 2013. ^ "Updates on Investigation into Multiple Explosions in Boston — Video and Photos Released in Bombings Case". The FBI Federal Bureau of Investigation. US: Department of Justice. April 18, 2013. Retrieved April 18, 2013. ^ a b Smith, Matthew; Patterson, Thomas (April 19, 2013). "FBI: Help us ID Boston bomb suspects". CNN. Retrieved April 24, 2013. ^ a b Montgomery, David; Horwitz, Sari; Fisher, Marc (April 20, 2013). "Police, citizens and technology factor into Boston bombing probe". The Washington Post. ^ Valencia, Milton J.; Wen, Patricia; Cullen, Kevin; Ellement, John R.; Finucane, Martin (March 4, 2015). "Defense admits Tsarnaev took part in Marathon bombings". The Boston Globe. Retrieved March 4, 2015. ^ "Police believe Tsarnaev brothers killed officer for his gun". CBS News. April 23, 2013. Retrieved April 11, 2015. ^ a b c Murphy, Shelley; Valencia, Milton J.; Lowery, Wesley; Johnson, Akilah; Moskowitz, Eric; Wangsness, Lisa; Ellement, John R. (April 19, 2013). "Search for marathon bombing suspect locks down Watertown, surrounding communities". The Boston Globe. Retrieved April 19, 2013. Originally titled "Chaos in Cambridge, Watertown after fatal shooting". ^ "Police: MIT police officer fatally shot, gunman sought". WHDH.com. Sunbeam Television. April 19, 2013. Archived from the original on April 22, 2013. Retrieved April 19, 2013. ^ a b Gorman, Siobhan; Barrett, Devlin (April 25, 2013). "Judge Made Miranda-Rights Call in Boston Bombing Case". The Wall Street Journal. Dow Jones. Retrieved April 25, 2013. ^ "Suburb becomes war zone in days after bombings". Archived from the original on April 21, 2013. Retrieved April 22, 2013. ^ a b Finn, Peter; Leonnig, Carol D.; Englund, Will (April 19, 2013). "Tamerlan Tsarnaev and Dzhokhar Tsarnaev were refugees from brutal Chechen conflict". The Washington Post. Retrieved April 20, 2013. ^ "Details Emerge of Alleged Carjacking by Bomber Suspects". The Wall Street Journal. Retrieved April 22, 2013. ^ Harris, Dan (April 23, 2013). "Alleged Bombers' Carjack Victim Barely Escaped Grab as He Bolted". ABC News. Retrieved April 25, 2013. ^ "From fear to cheers: The final hours that paralyzed Boston". CNN. April 28, 2013. Retrieved April 29, 2013. ^ a b "Police chief: Boston manhunt began with intense firefight in dark street". CNN. April 20, 2013. Retrieved April 11, 2015. ^ a b c Carter, Chelsea J.; Botelho, Gregory (April 20, 2013). "'Captured !! !' Boston police announce Marathon bombing suspect in custody". CNN. ^ a b Arsenault, Mark; Murphy, Sean P (April 21, 2013). "Marathon bombing suspects threw 'crude grenades' at officers". The Boston Globe Metro. Retrieved April 22, 2013. ^ Estes, Adam Clark (April 2013). "An Officer's Been Killed and There's a Shooter on the Loose in Boston". The Atlantic Wire. Retrieved April 19, 2013. ^ Leger, Donna (April 22, 2013). "Police chief details chase, capture of bombing suspects". USA Today. Retrieved April 22, 2013. ^ a b c DeWitt, Vincent (July 8, 2013). "Watertown Mass. Police describe takedown of Boston Marathon bombers". New York Post. Retrieved March 26, 2016. ^ a b Smith, Tovia (March 25, 2016). "Filming For Marathon Bombing Movie Stirs Emotions In Boston". NPR. Retrieved March 26, 2016. ^ "The First Photos of The Boston Bombing Suspects' Shootout With Police". Dead spin. Retrieved April 23, 2013. ^ "Boston Bombing Suspect Shootout Pictures". Get on hand. Retrieved April 23, 2013. ^ Farberov, Snejana; Thompson, Paul (April 21, 2013). "Boston bomb suspect: Commissioner Ed Davis says Dzhokhar Tsarnaev killed his brother". Daily Mail. London. Retrieved April 22, 2013. ^ "102 hours in pursuit of Marathon suspects". The Boston Globe. ^ "Boston Marathon bomb suspect still at large". BBC. April 20, 2013. Retrieved April 20, 2013. ^ a b "MBTA Police Officer Shot While Chasing Bombing Suspects". WBZ. CBS Radio. April 19, 2013. Retrieved April 19, 2013. ^ a b "Bullet that nearly killed MBTA police officer in Watertown gunfight appears to have been friendly fire". Boston. Retrieved May 20, 2014. ^ "Donohue Talks Miracle Survival On Toucher & Rich: 'I Don't Have An Explanation For It'". CBS Boston. April 15, 2014. ^ Schworm, Peter; Cramer, Maria (April 30, 2013). "Harvard report praises response to Marathon bombings". The Boston Globe. ^ "Boston Bombing Suspects, Tzarnaev Brothers, Had One Gun During Shootout With Police: Officials". Huffington Post. April 24, 2013. Retrieved April 24, 2013. ^ Date, Jack; Matthew Mosk (April 24, 2013). "Single Gun Recovered From Accused Bombers". ABC The Blotter. ABC News. Retrieved May 16, 2013. ^ "Green Honda could prove crucial if Tsarnaev charged in MIT officer's killing – Investigations". Investigations.nbcnews.com. August 29, 2010. Retrieved July 24, 2013. ^ Helmuth, Laura. "Pronounce Boston bomb names: Listen to recording of names of Dzhokhar Tsarnaev, Tamerlan Tsarnaev". Slate.com. Retrieved May 8, 2013. ^ a b Abad-Santos, Alexander (April 19, 2013). "Who Is Dzhokhar Tsarnaev, the Man at the Center of the Boston Manhunt?". The Atlantic. Retrieved April 19, 2013. ^ Naughton, Philippe (April 19, 2013). "Live: Boston bomb suspect killed by police, one hunted". The Times. UK. Retrieved April 19, 2013. ^ "Officials in Watertown field calls from worried residents – Watertown – Your Town". The Boston Globe. April 2013. Retrieved April 11, 2015. ^ "Suburban police played a key role in bombing investigation". The Boston Globe. April 25, 2013. Retrieved April 29, 2013. By 6 pm Friday, Governor Deval Patrick suspended the "shelter-in-place" order for Watertown, Belmont, Boston, Brookline, Cambridge, Newton, and Waltham after the manhunt came up empty. ^ "Important Public Safety Alert 4/19/13". Archived from the original on May 2, 2013. Retrieved April 29, 2013. ^ Rawlings, Nate (April 19, 2013). "Was Boston Actually on Lockdown?". Time. Retrieved April 29, 2013. ^ "City of Somerville Safety Advisory". Somerville News. April 19, 2013. Retrieved April 11, 2015. ^ "Gunfire heard in search for Boston Marathon bomb suspect". Reuters. April 19, 2013. Retrieved April 19, 2013. ^ "Boston Marathon Manhunt: Search for bombing suspect is law enforcement's first major test of post-9/11 training". CBS News. April 19, 2013. Retrieved April 19, 2013. ^ "Boston police". Twitter. April 19, 2013. Retrieved April 11, 2015. Taxi service in the City of Boston has been restored. ^ a b c Mutzabaugh, Ben (April 19, 2013). "Boston flights operating, airlines waive change fees". USA Today. Retrieved April 19, 2013. ^ Williams, Pete; Esposito, Richard; Isikoff, Michael; Connor, Tracy (April 8, 2015). "'We got him! ': Boston bombing suspect captured alive". NBC News. Retrieved April 8, 2015. ^ "Boston Bomb Suspect's Dad Tells Him to Surrender, Warns 'Hell Will Break Loose' if Son Dies". ABC News. April 19, 2013. Archived from the original on April 22, 2013. Retrieved April 19, 2013. ^ "Boston Marathon bombers: suspect Dzhozkar Tsarnaev's uncle Ruslan Tsarni pleads 'turn yourself in'". The Telegraph. London, UK. Associated Press. April 19, 2013. Retrieved April 19, 2013. ^ "Second Boston Marathon bombing suspect in custody". WCBV. April 20, 2013. Archived from the original on October 30, 2018. Retrieved April 20, 2013. ^ "Boston police explain how bombing suspect was caught". UK: BBC News. April 20, 2013. Retrieved April 29, 2013. ^ Anderson, Derek J. (April 19, 2013). "Watertown family finds alleged marathon bomber in boat". The Boston Globe. Retrieved April 19, 2013. ^ Thomas, Linda (April 21, 2013). "Northwest technology helped find Boston bombing suspect". MyNorthwest.com. Retrieved April 21, 2013. ^ By Evan Allen (April 23, 2013). "Boston police superintendent recounts officers' long search, tense final confrontation". The Boston Globe. Retrieved May 8, 2013. ^ Johnson, Kevin (April 20, 2013). "As manhunt ends, new questions emerge in Boston bombings". USA Today. Retrieved April 20, 2013. ^ a b Horwitz, Sari; Finn, Peter (April 24, 2013). "Officials: Boston suspect had no firearm when barrage of bullets hit hiding place". Retrieved October 15, 2017 – via www.WashingtonPost.com. ^ Horwitz, Sari; Peter Finn (April 24, 2013). "Officials: Boston suspect had no firearm when barrage of bullets hit hiding place". The Washington Post. Retrieved April 24, 2013. ^ "Bombing suspect surrounded in Watertown". The Lowell Sun. Retrieved April 20, 2013. ^ "Shots Fired in Watertown (Update: Police Have Suspect In Custody)". Mediaite. Retrieved April 20, 2013. ^ "Boston suspect Dzhokhar Tsarnaev remains in critical condition". The Washington Post. Retrieved April 22, 2013. ^ "Dzhokhar Tsarnaev Criminal Complaint Offers New Details in Boston Marathon Bombing". Huffington Post. Retrieved April 26, 2013. ^ "Inside Boston manhunt's end game – Anderson Cooper 360". CNN. April 22, 2013. Retrieved May 8, 2013. ^ Halper, Daniel (April 20, 2013). "Lawmakers: Treat Suspect as 'Enemy Combatant'". The Weekly Standard. Retrieved April 20, 2013. ^ Chambliss, Saxby. "US Senator for Georgia' statement on the Boston terror arrest". News Center (Press Releases). United States Senate. Archived from the original on March 7, 2014. Retrieved April 22, 2013. ^ Mungin, Lateef (April 20, 2013). "What's next for the Boston Marathon bombing suspect?". CNN. Retrieved April 11, 2015. ^ Glueck, Katherine (April 20, 2013). "Lindsey Graham: 'Enemy combatant'". Politico. ^ a b c Tapper, Jack; Smith, Matthew (April 23, 2013). "Boston bomb suspect: My brother was the mastermind". CNN. Retrieved April 29, 2013. ^ "Boston Marathon bombing suspect Dzhokhar Tsarnaev silent after read Miranda rights". CBS. Associated Press. April 25, 2013. Retrieved April 11, 2015. ^ "Feds Make Miranda Rights Exception for Marathon Bombing Suspect Dzhokhar Tsarnaev". ABC News. April 19, 2013. Retrieved April 11, 2015. ^ "The Right to Remain Silent: Dzokhar Tsarnaev, the Public Safety Exception, and Miranda in a post-911 World". Marathon Law. April 22, 2013. Archived from the original on June 13, 2013. Retrieved April 10, 2015. ^ Cohen, Andrew (April 20, 2013). "Tsarnaev Without Tears: The Legal Way Forward". The Atlantic. Retrieved April 11, 2015. ^ Bazelon, Emily (April 19, 2013). "Why Should I Care That No One's Reading Dzhokhar Tsarnaev His Miranda Rights?". Slate. Retrieved April 11, 2015. ^ "18 USC 2332a(a) – Use of weapons of mass destruction". Cornell. ^ Serrano, Richard A.; Bennett, Brian; Memoli, Michael A. (April 22, 2013). "Boston bombing suspect charged, questioned". Los Angeles Times. Retrieved April 23, 2013. ^ Boston bombings suspect Dzhokhar Tsarnaev taken from hospital to prison, CBS News. Retrieved April 26, 2013. ^ "Boston bomb suspect in small cell with steel door". CBS News. April 27, 2013. Retrieved May 17, 2013. ^ "Dzhokhar Tsarnaev in Solitary at Devens' Segregated Housing Unit – TalkLeft: The Politics Of Crime". TalkLeft. April 28, 2013. Retrieved May 17, 2013. ^ Ford, Beverly. "Boston Bombing Suspect Spends 23 Hours a Day Alone in Jail Cell". RIA Novosti. Retrieved April 11, 2015. ^ "Boston Marathon bombing suspect pleads not guilty". cbc.ca. July 10, 2013. Retrieved April 8, 2015. ^ "Court papers say Dzhokhar Tsarnaev had fractured skull, hand after manhunt" by Laurel J. Sweet, The Boston Herald. ^ Stanglin, Doug (September 23, 2013). "Tsarnaev lawyers ask for more time". USA Today. Retrieved April 11, 2015. ^ Valencia, Milton J. (October 2, 2013). "Tsarnaev lawyers want prison restrictions eased". The Boston Globe. ^ "Opening statements in Tsarnaev trial could begin in early March, official says – Metro – The Boston Globe". BostonGlobe.com. Retrieved April 8, 2015. ^ "Excerpt Jury Trial Day Twenty-Seven: Opening Statement by Mr. Weiner" (PDF). United States v. Dzhokhar A. Tsarnaev. (D. Mass 2015). March 4, 2015. No. 13-cr-10200-GAO. ^ "Excerpt Jury Trial Day Twenty-Seven: Opening Statement by Ms. Clarke" (PDF). United States v. Dzhokhar A. Tsarnaev. (D. Mass 2015). March 4, 2015. No. 13-cr-10200-GAO. ^ Ann O'Neill, CNN (March 30, 2015). "U.S. ends Boston bombing case with grisly photos – CNN.com". CNN. Retrieved April 8, 2015. ^ "Tsarnaev defense was able to plant seeds of doubt – Metro – The Boston Globe". BostonGlobe.com. Retrieved April 8, 2015. ^ Sweet, Laurel J. (April 8, 2015). "Dzhokhar Tsarnaev convicted on all charges in Boston Marathon bombing trial". Boston Herald. United States. Herald Media Inc. Retrieved April 8, 2015. ^ Суд: слушания о мере наказания Царнаеву начнутся 21 апреля [Court Hearings on the measure Tsarnaevu punishment will begin April 21]. RIA Novosti (in Russian). April 10, 2015. Retrieved April 10, 2015. ^ "Boston in shock over Tsarnaev death penalty". BBC News. ^ "Dzhokhar Tsarnaev Apologizes for Boston Marathon Bombing". ABC News. June 24, 2015. ^ "Boston Marathon bomber appeals conviction, death sentence". CNBC News. ^ Schmitt, Eric; Mazzetti, Mark; Schmidt, Michael S.; Shane, Scott (May 2, 2013). "Boston Plotters Said to Initially Target July 4 for Attack". The New York Times. Retrieved April 11, 2015. ^ "Boston Marathon was 'target of opportunity,' bombs built in attacker's home, sources say". Fox News Channel. May 2, 2013. Retrieved May 19, 2013. ^ Douglas, Scott (May 3, 2013). "Marathon was 'Target of Opportunity,' Bombing Suspect Says". RunnersWorld.com. Retrieved May 19, 2013. ^ Wilson, Scott (April 23, 2013). "Boston bombing suspect cites U.S. wars as motivation, officials say". The Washington Post. et al. Retrieved April 23, 2013. ^ Michael Isikoff (April 22, 2013). "FBI agents question members of mosque that Tsarnaevs attended". NBC. Retrieved April 26, 2013. ^ "Boston Marathon Bombing Trial Jury Sees Photos Of Tsarnaev Boat Note". CBS Local Boston. March 10, 2015. Retrieved March 12, 2017. ^ Shane, Scott; Barry, Ellen (May 16, 2013). "Note by Boston Bombing Suspect Sheds Light on Motive, Officials Say". The New York Times. Retrieved April 11, 2015. ^ a b Wangsness, Lisa; Brian Ballou (April 20, 2013). "Islam might have had secondary role in Boston attacks". The Boston Globe. Retrieved April 26, 2013. ^ Siddique, Haroon and agencies (April 25, 2013). "Boston bombing suspect was put on terrorist database 18 months ago". The Guardian. London. Retrieved April 25, 2013. ^ Michele McPhee (April 9, 2017). "Tamerlan Tsarnaev: Terrorist. Murderer. Federal Informant?". Boston Magazine. ^ Lara Turner (April 9, 2015). "Was Tamerlan Tsarnaev an FBI Informant? Odds Say it's Possible". Who.What.Why. ^ Rachel Paiste (March 28, 2014). "Tamerlan Tsarnaev Was Approached To Be An Informant, Defense Says". WBUR News. ^ Jamie Bologna and Meghna Chakrabarti (June 15, 2017). "Unanswered Questions About Tamerlan Tsarnaev". WBUR. ^ "Boston Marathon Bombings: Turn to Religion Split Bomb Suspects Tamerlan and Dzhokhar Tsarnaev's Home". The Wall Street journal. Retrieved April 22, 2013. ^ a b Elder, Miriam; Williams, Matthew 'Matt' (April 19, 2013). "Chechnya connections build picture of Tamerlan and Dzhokhar Tsarnaev". The Guardian. London. Retrieved April 21, 2013. ^ Sullivan, Eileen (April 19, 2013). "Manhunt in Boston after bombing suspect is killed". My way. Associated Press. Archived from the original on April 2, 2015. Retrieved April 19, 2013 – via Internet Archive. ^ "Boston Marathon bombings: Suspects' mother Zubeidat says she found faith, not terrorism". The Star. Toronto. April 28, 2013. Retrieved April 11, 2015. ^ a b Goode, Erica (April 19, 2013). "Brothers Seen as Good Students and Avid Athletes". The New York Times. Retrieved April 19, 2013. ^ a b Kaleem, Jaweed (April 19, 2013). "Boston Bombing Suspects' Muslim Identity Provides Few Clues To Motivation For Bombing". Huffington Post. Retrieved April 19, 2013. ^ a b Noronha, Charmaine (April 19, 2013). "Aunt says US suspect recently became devout Muslim". Huffington Post. Retrieved April 19, 2013. ^ Carter, Chelsea J; Botelho, Gregory (April 20, 2013). "'Captured !! !' Boston police announce Marathon bombing suspect in custody". CNN. Retrieved April 11, 2015. ^ Perez, Evan; Smith, Jennifer; Shallwani, Pervaiz (April 19, 2013). "Boston Bombing Suspect Killed in Shootout". The Wall Street Journal. Retrieved April 19, 2013. ^ Hirn, Johannes (2010). "Will box for Passport: An Olympic Drive to become a United States citizen" (PDF). The Comment. Archived from the original (PDF) on April 19, 2013. Retrieved April 20, 2013. ^ Burke, Timothy (April 19, 2013). "Everything we know about Tamerlan Tsarnaev, dead bombing suspect". Deadspin. Retrieved April 20, 2013. ^ Cooper, Michael (May 4, 2013). "Path From 'Social Butterfly' to Boston Suspect's Widow". The New York Times. Retrieved May 8, 2013. ^ a b Nathan, Sara; Bates, Daniel (April 19, 2013). "Our hearts are sickened by the horror he inflicted': Shocked family of All-American girl who converted to Islam to marry Boston bomber say tragedy proves 'we never really knew him". Daily Mail. London, UK. Retrieved April 20, 2013. ^ "Tamerlan Tsarnaev". FBI. Retrieved October 12, 2017. ^ CNN, Eric Levenson,. "Boston bomber Tamerlan Tsarnaev told FBI he never picked a fight". CNN. Retrieved October 12, 2017. ^ "Tamerlan Tsarnaev said he had no American friends". Now. MSN. Archived from the original on April 20, 2013. Retrieved April 20, 2013. ^ a b Lister, Tim; Cruickshank, Paul (April 20, 2013). "Older brother in Boston bombings grew increasingly religious, analysis shows". CNN. Retrieved April 11, 2015. ^ Morales, Mark; Adams Otis, Ginger (April 21, 2013). "Bombing suspect brothers became more religious, radical after Tamerlan Tsarnaev's 2012 trip to Russia: friends". Daily News. New York. Retrieved April 11, 2015. ^ a b Schmitt, Eric; Schmidt, Michael S.; Barry, Ellen (April 21, 2013). "Inquiry Shifts to Suspect's Russian Trip". The New York Times. p. A1. Retrieved April 20, 2013. ^ Forster, Peter (April 21, 2013). "Boston bomber arrested: Tamerlan Tsarnaev's hateful rage behind American dream". The Telegraph. London, UK. Retrieved April 11, 2015. ^ Radia, Kiril (April 20, 2013). "Boston Bomb Suspect Alarmed Russian Relatives With Extremist Views". ABC news. Retrieved April 11, 2015. ^ Tangel, Andrew; Powers, Ashley (April 20, 2013). "FBI: Boston suspect Tamerlan Tsarnaev followed 'radical Islam'". Los Angeles Times. ^ Waxman, Olivia B. (April 20, 2013). "Brother's Keeper: Did Older Sibling Lure Bombing Suspect Into Plot?". Time. Retrieved April 11, 2015. ^ Titterton, Sarah (April 20, 2013). "Boston marathon bombs: Tamerlan Tsarnaev 'interviewed by FBI in 2011'". The Telegraph. London. ^ "FBI got information from Russian FSB that Tamerlan Tsarnaev was radical Islam follower". The Washington Post. Associated Press. April 20, 2013. Archived from the original on April 23, 2013. Retrieved April 20, 2013. ^ Englund, Will; Finn, Peter (April 20, 2013). "Conflict in the Caucasus, reflected in suspect's YouTube playlist". The Washington Post. Retrieved April 11, 2015. ^ "Older Boston Suspect Made Two Trips to Dagestan, Visited Radical Mosque, Officials Say". Time. April 22, 2013. Retrieved April 11, 2015. ^ a b Nemtsova, Anna (April 22, 2013). "The Caucasus Connection: At a radical mosque in Dagestan, alleged marathon bomber Tamerlan Tsarnaev is remembered by many worshippers—and the secret police". The Daily Beast. Retrieved April 23, 2013. ^ "Kotrova Street, Makhachkala". Bing. Microsoft. April 16, 2013. Retrieved April 23, 2013. ^ Jakes, Lara; Sullivan, Eileen (April 23, 2013). "From outsiders to bombing suspects in Boston". The Miami Herald. Archived from the original on April 27, 2013. Retrieved April 24, 2013 – via Internet archive. ^ McBride, Janet (April 23, 2013). "Special Report: The radicalization of Tamerlan Tsarnaev". Reuters. Retrieved April 11, 2015. ^ "Bombing suspect attended UMass Dartmouth, prompting school closure; college friend shocked by charge he is Boston Marathon bomber". Boston. April 19, 2013. Archived from the original on April 21, 2013. ^ Schuppe, Jon (April 19, 2013). "Brothers' Classic Immigrant Tale Emerges as Relatives Speak Out". NBC Bay Area. Retrieved April 21, 2013. ^ Deprez, Esmé E.; Gopal, Prashant (April 19, 2013). "Brothers Suspected in Boston Bombing Straddled Cultures". Bloomberg L.P. Retrieved April 21, 2013. ^ a b Rezendes, Michael (April 22, 2013). "Police probe possible link between Marathon bomber and unsolved triple homicide in Waltham". The Boston Globe. Retrieved April 23, 2013. ^ "Boston Bombing Brings Twist to Cold Murder Case". ABC News. April 29, 2013. Retrieved May 6, 2013. ^ "'They're all dead': Waltham killings likely not random – Metro – The Boston Globe". BostonGlobe.com. Retrieved April 8, 2015. ^ a b "In 2011 Murder Inquiry, Hints of Missed Chance to Avert Boston Bombing". The New York Times. July 11, 2013. ^ Chandler, Adam (April 22, 2013). "Boston Bomber Suspected in Triple Homicide". Tablet. Retrieved April 23, 2013. ^ "Bombers' mother told older son to go to 'Palestine'". The Times of Israel. April 28, 2013. Retrieved May 3, 2013. ^ "Suspects' Mother Was Placed on Watch List". The Wall Street Journal. April 28, 2013. Retrieved April 11, 2015. ^ Sison, Bree. "Injured Saudi man not a suspect in Boston attacks". CBS News. Retrieved April 17, 2013. ^ Nelson, Steven. "Boston Police: 'We Are Questioning Many People'". U.S. News & World Report. Retrieved April 16, 2013. ^ Hunter, Walker (April 16, 2013). "Boston Police Commissioner: 'There Is No Suspect In Custody'". Talking Points Memo. Retrieved April 16, 2013. ^ Hallowell, Billy (April 22, 2013). "Saudi National Questioned in Boston Bombings Was Allegedly Flagged on Terror Watch List". Retrieved April 11, 2015. ^ Smith, Matt; Levs, Josh (April 17, 2013). "FBI will try to rebuild Boston bombs". CNN. Retrieved April 17, 2013. ^ "Large police presence in Revere connected to Boston bombing". WFXT. Retrieved April 16, 2013. ^ "Bombing suspect dead after gunfight, one still at large". World News Australia. April 19, 2013. Retrieved April 11, 2015. ^ "Police hunt Boston bombing suspect" (live updates). New Zealand: News 3. April 20, 2013. Retrieved April 11, 2015. ^ "Police Converge on Watertown Block, Set Up Perimeter in Hunt For Bomb Suspect". Fox 17. April 20, 2013. Retrieved April 11, 2015. ^ "Man 'linked to Boston suspect' killed by FBI". Al Jazeera. October 4, 2011. Retrieved May 25, 2013. ^ Schmidt, Michael S.; Rashbaum, William K.; Oppel, Jr., Richard A. (May 22, 2013). "Deadly End to FBI Queries on Tsarnaev and a Triple Killing". The New York Times. Retrieved May 22, 2013. ^ U.S. News (April 8, 2015). "Father of slain man linked to Boston bombing suspect maintains son's innocence". NBC News. Retrieved April 8, 2015. ^ a b c d e Michael Kelley (May 1, 2013). "Here's What We Know About The Three New Suspects Linked To Alleged Boston Bomber Dzhokhar Tsarnaev". Business Insider. Retrieved May 2, 2013. ^ a b Winter, Michael (May 1, 2013). "Bomb suspect's friend Robel Phillipos: Who is he?". USA Today. Retrieved January 2, 2015. ^ a b "Bombing Suspect's Friend, Robel Phillipos, Released on Bail". The Wall Street Journal. Retrieved May 8, 2013. ^ a b "Police take 3 into custody in New Bedford at housing complex where Boston bombing suspect may have lived". MassLive.com. April 19, 2013. Retrieved April 11, 2015. ^ a b Peterson, Hayley (April 20, 2013). "The moment one woman and two men were taken into custody over Boston bombings near Dartmouth campus where suspect studied". Daily Mail. London. Retrieved April 11, 2015. ^ a b Ellement, John R.; Wallack, Todd; Sacchetti, Maria; Carroll, Matt; Finucane, Martin (May 1, 2013). "Two Kazakh men, Cambridge man, face charges in disposal of backpack owned by Boston Marathon bombing suspect". The Boston Globe. Retrieved May 2, 2013. ^ Ellement, John R.; Wallack, Todd; Sacchetti, Maria; Carroll, Matt; Finucane, Martin (May 1, 2013). "Three additional people taken into custody in Boston Marathon bombings". The Boston Globe. Retrieved May 2, 2013. ^ Vincent, H. Michael (April 21, 2013). "More arrests in Boston bombings, FBI eyes terror cell". Rockford Record. Retrieved April 11, 2015. ^ DeQuattro, Dee (April 22, 2013). "Two men in New Bedford arrested on immigration charges". ABC 6. ^ Taylor, Adam (May 1, 2013). "Here's The Criminal Complaint Against The New Suspects in the Boston Bombing Case". Business Insider. Retrieved May 2, 2013. ^ Kubin, Jacquie (May 1, 2013). "Boston Update: Azamat Tazhayakov, Dias Kadyrbayev arrested in bombings". Retrieved May 2, 2013. ^ "News". msn.com. Retrieved April 8, 2015. ^ "Dzhokhar Tsarnaev's College Friend Pleads Guilty". Boston Magazine. August 22, 2014. Retrieved April 8, 2015. ^ "Tsarnaev friends' sentencing delayed". WCBV 5 (ABC). November 7, 2014. Retrieved April 8, 2015. ^ a b McMahon, Shannon; Sargent, Hilary (June 5, 2015). "Tsarnaev friend Tazhayakov sentenced to 42 months for obstruction of justice". The Boston Globe. ^ Valencia, Milton (May 17, 2016). "Tsarnaev friend to be released from prison". The Boston Globe. Retrieved July 12, 2017. ^ "Robel Phillipos, Friend of Boston Marathon Bombing Suspect, Is Found Guilty". The New York Times. Associated Press. October 29, 2014. Retrieved October 28, 2014. ^ Williams, Timothy (October 28, 2014). "Boston Bombings Suspect's Friend Convicted of Lying to F.B.I." The New York Times. Retrieved January 2, 2015. ^ Wen, Patricia; Valencia, Milton J.; Ellement, John R.; Finucane, Martin (June 5, 2015). "Robel Phillipos sentenced to three years in prison". The Boston Globe. ^ "Marathon Bomber's Friend Robel Phillipos Files Appeal". NECN. June 12, 2015. ^ Staff, Writer (February 26, 2018). "Pal of Boston Marathon bomber released from Philly re-entry management program". WPVI-TV. Associated Press. Retrieved April 15, 2018. ^ Hanna, Jason; Castillo, Mariano (May 30, 2014). "Massachusetts man charged with obstructing Boston bombings probe". CNN. Retrieved April 8, 2015. ^ a b c d Ly, Laura (June 18, 2015). "Friend of Boston marathon bombers gets 30-month sentence". CNN. ^ Zalkiind, Susan (March 26, 2015). "The FBI Is Trying to Destroy My Life". The Daily Beast. ^ Lavidor-Berman, Adrienne (April 16, 2013). "Bombings at the Boston Marathon". The Boston Globe. Retrieved April 16, 2013. ^ 奥巴马：我们为吕令子的中国家人祈祷 [Obama: We pray for Lu Lingzi's Chinese family] (video). Sohu (in Chinese). April 19, 2013. Retrieved April 19, 2013. ^ 【波士頓爆炸】第3名死者： 中國公民呂令子 [Boston explosion No. 3 deceased: Chinese citizens Lu Lingzi]. Apple Daily (in Chinese). Phoenix Television. April 17, 2013. Archived from the original on May 5, 2013. Retrieved April 17, 2013. ^ Johnson, Jenna; Mufson, Steven (April 18, 2013). "Boston University identifies third bombing victim as Lu Lingzi". The Washington Post. Retrieved April 18, 2013. ^ "Memorial honors Boston victims". News (photo gallery). Yahoo!. April 20, 2011. Retrieved April 19, 2013. ^ "Letter from the Family of Lu Lingzi". Bu.edu. April 17, 2013. Retrieved May 8, 2013. ^ Fantz, Ashley (April 17, 2013). "Death of terror's tiniest victim called 'surreal,' 'tragic'". CNN. Retrieved April 17, 2013. ^ "Family says goodbye to youngest blast victim". Retrieved April 27, 2013. ^ Schoenberg, Shina (August 22, 2013). "Slain police officer Sean Collier, killed following Boston Marathon explosions, posthumously appointed to Somerville Police Department". MassLive. Somerville. Retrieved April 11, 2015. ^ Bidgood, Jess (April 24, 2013). "On a Field at M.I.T., 10,000 Remember an Officer Who Was Killed". The New York Times. Retrieved May 15, 2013. ^ "Just 2 bombing victims still critically ill, but count of injured rises to 282". The Boston Globe. April 23, 2013. Retrieved May 8, 2013. ^ Dahler, Don (April 26, 2013). "For Boston bombing survivor, a life-changing decision". CBS News. Retrieved April 27, 2013. ^ a b "FBI takes over investigation, seeking suspects, motives in Boston bombings". Central Florida News 13. April 16, 2013. Retrieved April 16, 2013. ^ "All Boston Marathon bombing patients likely to live, doctors say". CBS News. April 22, 2013. Retrieved April 26, 2013. ^ Weise, Elizabeth; MacDonald, G. Jeffrey; Weintraub, Karen (April 18, 2013). "At least 14 amputees are among wounded in Boston attack". USA Today. Retrieved April 11, 2015. ^ Zoroya, Gregg (April 17, 2013). "For Boston attack's amputees, road to recovery begins". USA Today. Retrieved April 20, 2013. ^ "'Rapid strides': Limb advances offer hope for Boston amputees". Retrieved April 29, 2013. ^ Kantor, Ira; McConville, Christine (April 16, 2013). "Docs describe nails, BBs viciously blasted into Marathon patients". Boston Herald. Retrieved April 17, 2013. ^ Kolata, Gina; Longman, Jeré; Pilon, Mary (April 17, 2013). "Physical Legacy of Bomb Blasts Could Be Cruel for Boston Marathon Victims". The New York Times. Retrieved April 18, 2013. ^ Nye, James (May 1, 2013). "Boston transit cop wounded in firefight with marathon bombers is expected to make full recovery...but doctors have left a bullet in his leg". Daily Mail. London. Retrieved May 2, 2013. ^ "Last Hospitalized Marathon Victim Heads Home". Associated Press. Retrieved July 24, 2013. ^ "Boston Marathon bombs: The world reacts". News. CBS. Retrieved April 17, 2013. ^ Reidy, Chris (April 24, 2013). "L.L.Bean commits $150,000 to the One Fund Boston". The Boston Globe. Retrieved April 24, 2013. ^ Trumbull, Mark (April 23, 2013). "How can you help Boston? One Fund sets up rules to help victims. (+video)". The Christian Science Monitor. Retrieved April 24, 2013. ^ Aleccia, JoNel (April 21, 2013). "Crowdfunding raises $2 million for Boston victims; critics urge caution". NBC News. Retrieved April 24, 2013. ^ Lebovic, Matt. "Israeli Team helps boston". The Times of Israel. Retrieved May 11, 2013. ^ a b Morton, Victor (April 15, 2013). "Boston Bruins' NHL game, Celtics' NBA contest cancelled in blast aftermath". The Washington Times. Retrieved April 15, 2013. ^ "All-Beethoven Program – Canceled". Boston Symphony Orchestra. April 15, 2013. Retrieved April 16, 2013. ^ "Red Sox postpone game". ESPN. Retrieved April 19, 2013. ^ "Nazareth agrees to be new host for national championship in place of MIT" (Press release). NCAA. April 19, 2013. Retrieved April 27, 2013. ^ Powers, Martine (April 16, 2013). "Tight security helps allay fears on the MBTA". The Boston Globe. Retrieved April 17, 2013. ^ Photograph Taken From the Arlington Shrine on April 16, 2013. Retrieved April 10, 2015. ^ "Grit and grief at makeshift Boston Marathon memorial". Sentinel & Enterprise. April 16, 2013. Retrieved April 11, 2015. ^ "An Update From Downtown Boston". WBUR. April 17, 2013. Retrieved April 11, 2015. ^ "Photos: Boylston Street After The Blasts". WBUR. April 17, 2013. Retrieved April 11, 2015. ^ "People gather at makeshift memorial near scene of Boston Marathon bombing". Mass Live. April 18, 2013. Archived from the original on April 2, 2015. Retrieved April 11, 2015. ^ "Makeshift memorial to Marathon bombing victims to be taken down, moved to city archives". Boston.com. June 21, 2013. Retrieved April 11, 2015. ^ Ramos, Nestor (April 14, 2018). "Fragments of tragedy, and of our best selves". The Boston Globe. Retrieved April 15, 2018. ^ Dezenski, Lauren. "BU starts scholarship to honor Chinese student who died in Marathon bombings." The Boston Globe. April 19, 2013. Retrieved April 19, 2013. ^ "Krystle Campbell Scholarships Awarded to UMass Students – University of Massachusetts Boston". Archived from the original on May 10, 2017. ^ "The mental health response to the Boston bombing: A three-year review". ^ Bhattacharyya, Sriya; Ashby, Kimberly M.; Goodman, Lisa A. (September 26, 2014). "Social Justice Beyond the Classroom". The Counseling Psychologist. 42 (8): 1136–1158. doi:10.1177/0011000014551420. ^ "Explosions hit Boston Marathon". BBC News. April 15, 2013. Retrieved April 11, 2015. ^ "Boston Marathon bomb blasts kill 2, injure dozens". CBC News. April 15, 2013. Retrieved April 15, 2013. ^ "Obama orders flags lowered to half staff". Politico. Retrieved April 16, 2013. ^ Mills, Carys (April 16, 2013). "Boston Marathon explosions add to market woes". Toronto Star. Retrieved April 17, 2013. ^ "Thousands cross Willamette for Boston Remembrance Run". KGW News. April 18, 2013. Archived from the original on April 22, 2013. Retrieved April 18, 2013. ^ "Marathon participants volunteers and spectators wear red socks in honor of Boston". Kfor. April 19, 2013. Retrieved April 11, 2015. ^ "Lansing Marathon runners hit the street to salute Boston". Detroit Free Press. Retrieved April 8, 2015. ^ "One Run For Boston 2". One Run for Boston. Retrieved April 8, 2015. ^ "Boston Marathon: Security beefed up worldwide after deadly blast". The Oregonian. Associated Press. April 15, 2013. Retrieved April 17, 2013. ^ "Boston Marathon 2013 was 'chaos': Canadian runners recount panic". National Post. April 15, 2013. Retrieved April 15, 2013. ^ Malkin, Bonnie (April 16, 2013). "Boston Marathon explosions: world leaders react". The Telegraph. UK. Retrieved April 19, 2013. ^ "International officials react to Boston attacks". Sports Illustrated. April 16, 2013. Retrieved April 19, 2013. ^ Fan, Jiayang (April 17, 2013). "Lu Lingzi's journey to the marathon". The New Yorker. Retrieved April 20, 2013. ^ "Parents of China Victim Get U.S. Visas." The Wall Street Journal. April 18, 2013. Retrieved April 21, 2013. ^ Katz, Gregory (April 16, 2013). "London to review marathon security". NZ: TV3. Archived from the original on June 13, 2013. Retrieved April 16, 2013. ^ "London Marathon: Runners and crowds mark Boston attack". UK: BBC News. April 21, 2013. Retrieved April 11, 2015. ^ "Ethiopia's Kebede wins London Marathon". Al Jazeera. Agence France-Presse. April 21, 2013. Retrieved April 21, 2013. ^ Crawford, Tiffany (April 17, 2013). "Vancouver Sun Run to donate $10 per late entry for Boston Marathon victims". The Vancouver Sun. Retrieved May 8, 2013. ^ "Czech Republic Forced to Remind the Internet That Chechnya Is in Different Country After Boston Bombing". Time. April 23, 2013. Retrieved May 8, 2013. ^ "Singapore Hit By Bomb Hoaxes After Boston Attacks". Retrieved April 11, 2015. ^ "Russia offers to help probe Boston blasts". News24. April 16, 2013. Retrieved April 16, 2013. ^ "Russia's PR machine ready for fallout from Boston bombings". The Hill. Retrieved April 26, 2013. ^ "Suspects' mother says bombing was staged with paint instead of blood". CNN. April 26, 2013. Retrieved April 25, 2013. ^ Shestakov, Yevgeny (April 26, 2013). Россия могла предотвратить теракт в Бостоне [Russia could have prevented a terrorist attack in Boston]. Rossiyskaya Gazeta (in Russian). Retrieved April 11, 2015. ^ Korotchenko, Igor (April 10, 2014). Эксперт: обвинения США по делу Царнаева политически мотивированы [Expert: U.S. blame around Tsarnaev case are politically motivated]. RIA Novosti (in Russian). Retrieved April 11, 2015. ^ Bender, Bryan; Bierman, Noah (April 23, 2013). "Russia contacted US government 'multiple' times". The Boston Globe. Retrieved March 27, 2017. ^ "Senate grills FBI over Boston bombings intel failures". RT. April 23, 2013. Retrieved April 11, 2015. ^ "Caught on Russian wiretap: Tsarnaev 'vaguely discussed jihad' with mother – US official". RT. April 28, 2013. Retrieved March 27, 2017. ^ Radia, Kirit (May 21, 2013). "Lawmakers Traveling to Russia to Investigate Boston Bombing". ABC News. Retrieved April 11, 2015. ^ Boston bombing suspects lost contact with Chechnya in childhood – Kadyrov's spokesman Interfax, April 19, 2013. ^ McCarthy, Tom; Elder, Miriam (April 19, 2013). "Chechen leader: 'The roots of evil must be searched for in America'". The Guardian. London, UK. ^ Заявление А. Закаева в связи с терактом в Бостоне [Statement of Akhmed Zakayev in connection with the terrorist attack in Boston]. Chechen Press (in Russian). April 19, 2013. Archived from the original on April 22, 2013. ^ "Daghestani Insurgency Denies Any Role in Boston Bombings". Radio Free Europe/Radio Liberty. April 13, 2013. Retrieved April 22, 2013. ^ "Statement of the Command of Mujahideen of Caucasus Emirate's Dagestan Province in relation to events in Boston". Kavkaz.org.uk. Archived from the original on February 7, 2014. Retrieved April 22, 2013. ^ Rawlings, Nate (April 19, 2013). "Was Boston Actually on Lockdown?". Time. ^ a b Cohen, Michael (April 21, 2013). "Why does America lose its head over 'terror' but ignore its daily gun deaths?". The Observer. London. Retrieved April 23, 2013. ^ Sabrina Siddiqui (April 29, 2013). "Ron Paul: Shutdown After Boston Bombings More Frightening Than Attack Itself". Huffington Post. Retrieved April 11, 2015. ^ "The Boston bombers have already scored a tremendous victory for terror". Haaretz. Retrieved April 23, 2013. ^ a b "Thoughts on the Boston Lockdown". The New York Times. April 22, 2013. Retrieved April 24, 2013. ^ Jaclyn Reiss (November 14, 2013). "Lawyers raising questions about Watertown home searches following Marathon bombings, shootout". Boston Globe. ^ Liz Klimas (April 23, 2013). "Was Watertown's Door-to-Door Search for Bombing Suspects a Violation of the Fourth Amendment?". Yahoo News. ^ Radley Balko (April 22, 2014). "Was the police response to the Boston bombing really appropriate?". The Washington Post. ^ "One Boston Day". One Boston Day. April 15, 2015. ^ Kristin Toussaint (April 14, 2016). "11 ways to participate in One Boston Day". Boston Globe Media Partners. ^ Tessa Yannone (April 13, 2018). "Your Guide to One Boston Day 2018". Boston Magazine. ^ Killoran, Ellen (April 16, 2013). "One Day After Boston Bombing, New York Post Has Not Retracted Presumably Incorrect Reports of Death Toll and Saudi Suspect". International Business Times. Retrieved April 22, 2013. ^ Kaufman, Alexander C. (April 15, 2013). "NY Post Fail? Police Deny Tabloid's Report of Suspect 'Under Guard'". Mediabistro.com. Retrieved April 22, 2013. ^ Webster, Stephen C. (April 18, 2013). "New York Post repeatedly misidentifies Boston suspects". The Raw Story. Retrieved April 22, 2013. ^ Davidson, Amy (April 17, 2013). "The Saudi Marathon Man". The New Yorker. Retrieved April 22, 2013. ^ Morales, Mark; Ford, Bev (January 11, 2013). "Boston Marathon spectator Salah Barhoum, who was interviewed by authorities following the bombings, swears he 'didn't do it'". Daily News. New York. Retrieved April 20, 2013. ^ a b Chittum, Ryan. "The New York Post's disgrace: Columbia Journalism Review". CJR. Retrieved April 20, 2013. ^ "Reconsidering the Internet detectives in Boston manhunt on Reddit and 4Chan: the benefits and pitfalls". Daily News. New York. Associated Press. Retrieved April 23, 2013. ^ Coscarelli, Joseph 'Joe' (April 20, 2013). "All the Mistakenly Identified 'Suspects' in the Boston Bombing Investigation". New York. Retrieved April 11, 2015. ^ "Innocents accused in online manhunt". 3 News NZ. April 22, 2013. Archived from the original on December 15, 2013. Retrieved April 11, 2015. ^ Briggs, Bill. "Missing Brown University student's family dragged into virally fueled false accusation in Boston". NBC. Retrieved April 23, 2013. ^ Chuck, Elizabeth (April 25, 2013). "Missing Brown University student found dead in Providence River, authorities confirm". NBC News. Retrieved April 25, 2013. ^ LoGiurato, Brett (April 17, 2013). "FBI Shreds The Media Over Unverified Boston Marathon Reports". Business Insider. Retrieved April 22, 2013. ^ Williams, Matt (April 17, 2013). "FBI urges media to 'exercise caution' after inaccurate arrest reports". The Guardian. London. Retrieved April 22, 2013. FBI (October 21, 2013). "Updates on Investigation into Multiple Explosions in Boston". FBI.gov. Federal Bureau of Investigation. Lessons Learned from the Boston Marathon Bombings: Preparing for and Responding to the Attack. Hearing Before the Committee on Homeland Security and Governmental Affairs, United States Senate. One Hundred Thirteenth Congress, First Session. July 10, 2013. S. Hrg. 113–226. The Boston Marathon Bombings, One Year On: A Look Back to Look Forward. Hearing Before the Committee on Homeland Security, House of Representatives. One Hundred Thirteenth Congress, Second Session. April 9, 2014. Serial No. 113–64. Lessons Learned from the Boston Marathon Bombings: Improving Intelligence and Information Sharing. Hearing Before the Committee on Homeland Security and Governmental Affairs, United States Senate. One Hundred Thirteenth Congress, Second Session. April 30, 2014. S. Hrg. 113–444. This page is based on the Wikipedia article Boston Marathon bombing; it is used under the Creative Commons Attribution-ShareAlike 3.0 Unported License (CC-BY-SA). You may redistribute it, verbatim or modified, providing that you comply with the terms of the CC-BY-SA.